When a trippy, time-bending, otherworldly flower transports scientist Nika Tensmith from across dimensions from the year 3727 to 1921, she meets and forms a life/universe altering connection with shell-shocked, WWI veteran, William Pike. 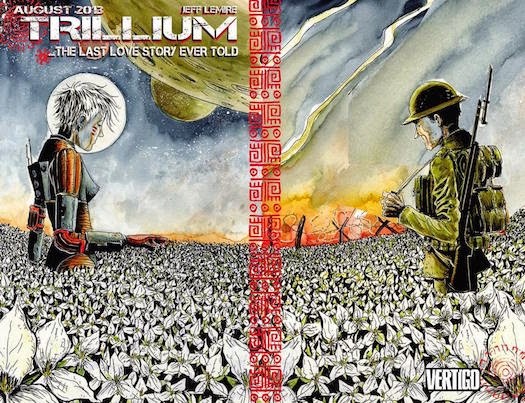 Though the fabric of time is fraying all around them, their refusal to let each other go, combined with black holes, aliens, pyramids, warmongers and a sentient plague that threatens to wipeout humankind, spawns writer and artist Jeff Lemire's romantic space opera, Trillium. Join our dizzying discussion through time and space as we talk all things Trillium on the night of March 12 from 6:30 pm to 8:00 pm. Is the concept innovative or cribbed from various, superior sci-fi stories? Nika and William's relationship: Epic, cosmic, love story or flimsily contrived, drug-induced infatuation? Upside down panels: Mind-bendingly effective or simply annoying? Did you take the time to decode the alien language? C'mon, be honest! Was the cipher an engaging element or a distracting gimmick? Lemire's art: Sloppily ugly or beautifully weird?